In my last blog post I described why we formed cross-functional business teams. In this blog post I am writing about team composition, that it changes over time and consequences of that. When we talk about the composition of cross-functional teams we usually have something like this in mind. The labels usually read developer, tester, designer and UX researcher or something along those lines. For the sake of this article we abstract from the specific role and just call them red, orange, yellow and brown experts. 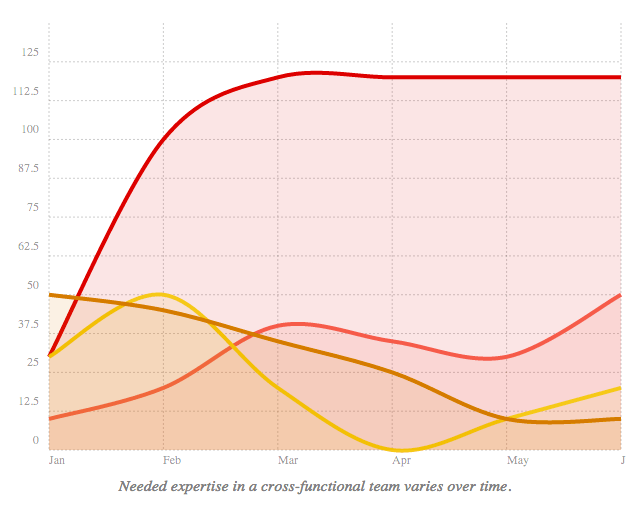 This visualisation of the team composition is ignoring the fact that the amount of needed expertise to build a product changes over time. In reality it looks something more like this. During product development there might be a phase where there is a lot of yellow work needed (Feb) while sometime later there is almost none (Apr) and then it’s picking up again. There is a certain threshold up to which it makes sense to have someone with a specific expertise full-time on the team. 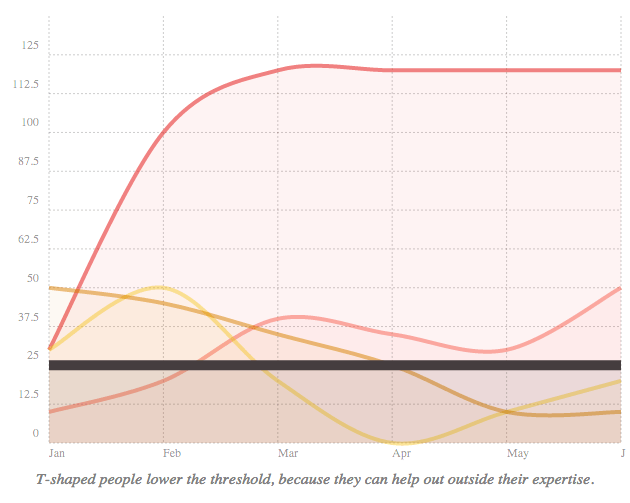 If the needed expertise goes under that threshold that expert won’t be fully utilised. Which is OK, if it’s just a dip, but will get boring and frustrating if persistent. 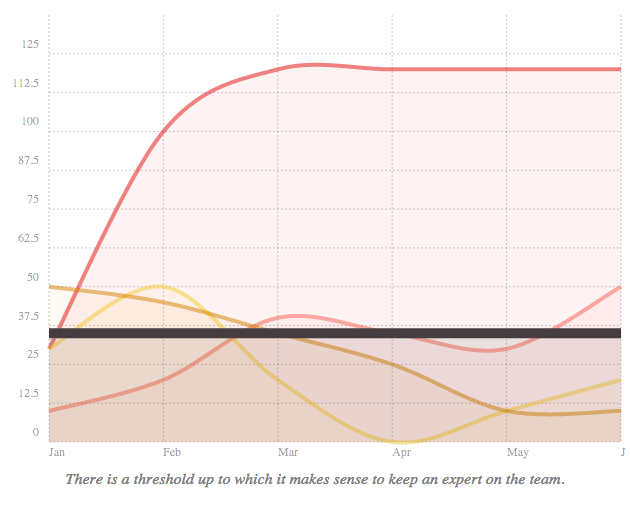 Looking at this, one might argue that the yellow expert should leave the team by mid-February and just be available to the team as needed. The orange expert joins the team around that time. The brown expert would leave sometime later around mid-March. This makes it effectively impossible to form a stable team that has the chance to gel and perform at it’s peak effectiveness. Having T-shaped people on the team helps with this since they can help out in other disciplines than their own. This lowers the threshold in our graphical visualisation. T-shaped: T-shaped people have two kinds of characteristics, hence the use of the letter “T” to describe them. The vertical stroke of the “T” is a depth of skill that allows them to contribute to the creative process. That can be from any number of different fields: an industrial designer, an architect, a social scientist, a business specialist or a mechanical engineer. The horizontal stroke of the “T” is the disposition for collaboration across disciplines. Now it makes sense to keep the yellow and brown experts for longer and bring on the orange one sooner. Having M-shaped people on the team helps even more since they combine two or more needed disciplines. This makes it easier to stay above the threshold. M-shaped: Building on top of the metaphor of T-shaped persons, M-shaped persons have expertise in two or more fields. 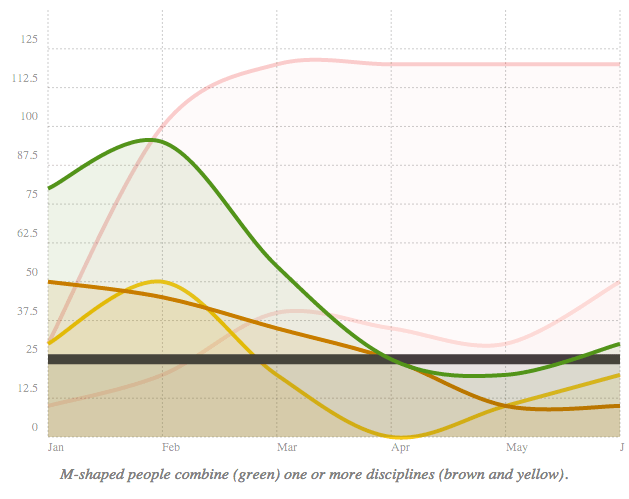 So, if our yellow expert was also an expert in the brown discipline, she would combine the areas below both of these lines resulting in the green line. Now, leaving the team because of under-utilisation is out of the picture. Apart from having people on the team that are valuable in more than one discipline there are of course other options to deal with slack than leaving the team. How about some Kaizen? Helping someone else working on a stuck task, going to that conference, reading that book, finally doing that refactoring or writing that blog post are just a few of them. Specialist teams are another option for experts that are having an effect here and there, but are not constantly needed on a team. In order to not create dependencies and thereby crippling autonomy of teams these specialist teams should be enablers and teachers helping teams. This means ownership stays with the teams, not with the specialists. At STYLIGHT we have for instance a platform team. Forming stable cross-functional teams in the face of changing needs of expertise over time is not trivial. Being aware of this and having strategies how to deal with slack for a specific discipline (T-shaped people, Kaizen) still make it a viable strategy though. For us the advantages of cross-functional teams outweigh these difficulties.